LEAVE NAME OF GIRL AND THE FIRST COMMUNION DATE AT THE CHECKOUT IN 'MESSAGE TO SELLER'! ALL JEWELRY IS MADE TO ORDER AND THE TURN AROUND TIME IS 1-2 WEEKS. LEAVE NAME OF GIRL AT THE CHECKOUT! This is a listing for a newborn pearl bracelet, in a personalized cute little bag, in a gift box. Ready for gift giving. The bracelet comes in a natural gift box, with a personalized scalloped gift tag in ivory. The gift tag has scalloped edges with an antiqued look. Every gift tag is made by myself, and a little rhinestone handplaced in the middle of the gift tag. The detailed sterling silver plated cross charm is about ½ inch and the monogram charm is 8mm. 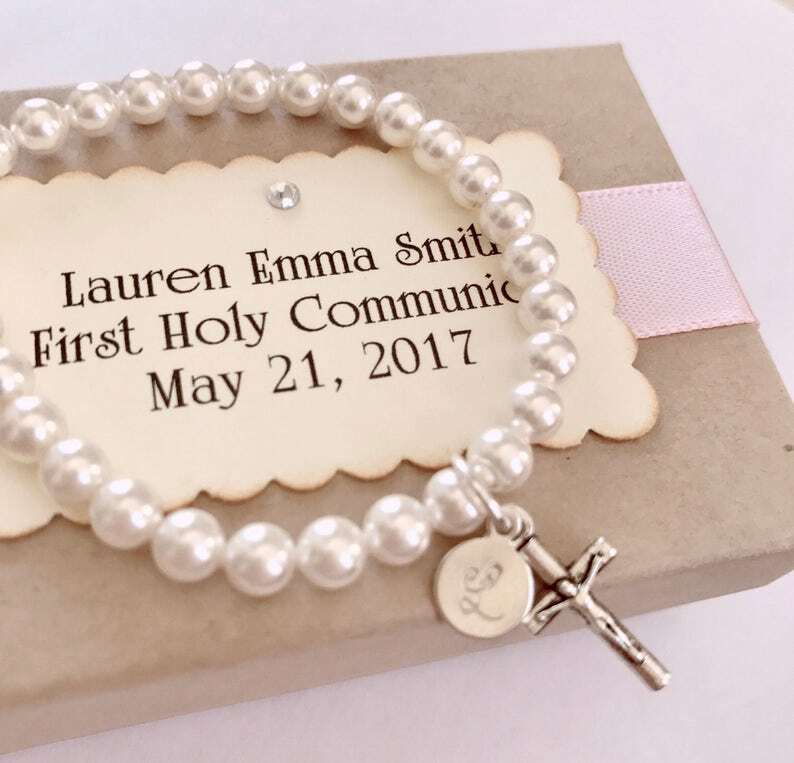 The bracelet comes in a cute little muslin bag with a cute religious stamp, in a natural gift box with satin ribbon (tiffany blue, pink, white or any other color of satin ribbon). Mention the preferred color of satin ribbon at the checkout. If not mentioned, I'll pick a color for you (tiffany blue or light pink). Please do not leave your child unattended with this jewelry. Since this bracelet is made to order, it will usually take up to 7 business days before your bracelet is ready for shipping. Let me know how long you want it to be. The bracelet will be wrapped in a cute little muslin bag, in a natural giftbox with satin ribbon. This sweet bracelet is a perfect gift as your little girl's first pearls. ****Please be advised that all products sold are meant to be an accessory for your child. Please DO NOT leave children unattended as the products do contain small pieces that could pose a choking hazard. Dutchpearl and it's owner is not responsible for any accidents with jewelry. LOVE these! The detail work is amazing and they are perfect for my nieces!